Brian has been a Physican Therapist since 2010. He spent a year as a traveling PT before finding his home in Port Townsend with his wife Caitlin (who also works at Jefferson Healthcare). 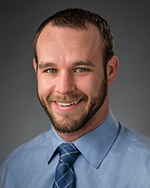 Brian treats each patient with a personalized plan of care including an emphasis on manual therapy intervention. A hands on approach helps provide feedback to the patient and assists in restoring strength and functional mobility. He believes movement is the best medicine and strives to assist his patients to achieve their goals and encourage a healthy and happy lifestyle. Brian enjoys distance running/trail running, swimming, hiking, kayaking and exploring the PNW with his wife and dog.